If you’re among those people who won’t settle for anything less than the best toilet seat, you’re in the right place. Let’s face it, not everyone pays much attention to a toilet seat until it breaks off. Once the hinges come off or cracks appear, the problems multiply. With my review guide, you have access to the top seats, and a buyer’s guide as well with in-depth reviews of our top picks. The Champion is worthy of its name as it comes with all the features you’d expect froma quality toilet. The unit comes with the bolts and screws needed for installation, so it should take just a minute or so to put the thing on. American Standard says the American Standard 5325.010.020 Toilet Seat is made from duroplast, a unique material so it resembles china. No new toilet seat is without a slow and quiet lid closing, and this is true for the Champion. The seat closes without making a noise: the sound of a toilet seat slamming down is annoying and can even be dangerous, not to mention it could damage the seat’s finish. With the slow close feature, it does away with the irritating loud noise and makes the seat safer for kids to use. When the time comes you have to clean the toilet, the Champion’s hinges make the job easier. Unlike other toilet seats you don’t need any tools to remove or install the Champion. One of the reasons why grime builds up around toilets is you cannot easily remove the seat: with the Champion you can take the seat off, making it easy to clean areas that would otherwise be hard to reach. The Champion is sold in white, bone, linen and black. The Kohler K-4636-0 combines the best of technology and style.It is compatible with all popular toilets and has specially designed rubber bumpers which keep the seat in place. These same rubber bumpers are also responsible in keeping the seat steady, and it uses the latest technology to prevent the seat from slamming down. The K-4636-0 also makes installation and cleaning easy for you. The ergonomically designed seat ensures optimum comfort levels for the user. It works with one and two piece toilets and it is made from polypropylene. Furthermore the cachet is going to be resistant to chipping, fading and staining. It’s available in a round front model, and the Q3 Advantage seat ensures it is a good fit. Aside from its styling, it is also compatible with various designs. Cachet Quiet-Close has a Quick-Release feature that ensures the seat slowly closes when you touch it. All it takes is a light touch to close it, and it’s not going to make any loud noise, unlike other toilet seats. The fact that only minimal contact is required means better hygiene. The toilet seat can also be removed for easy cleaning of the hinges. If you’ve got a two-piece toilet you can easily reach the part where the bowl and tank meet and clean it. The Mayfair 148SLOWA Wood Toilet Seat comes with a potty seat built-in, making it suitable for kids and adults. The hinges are also easy to remove so you can quickly clean the seat. The potty seat is magnetically secured in the wood cover recess so there is no need for you to lift the child potty seat manually.What this means is if the potty seat is there when you need it, but you can take it out if it’s no longer required. Aside from being easy to clean, the toilet seat is quiet. Unlike other toilet seats it closes slowly, preventing accidental pinching of fingers. The toilet seat also uses the STA-TITE Seat Fastening System so it is not just easy to install but won’t come off. Both adults and children appreciate the fact it’s slow closing as it doesn’t make a lot of noise. As many customers have also noted, children quickly get the hang of the seat, and it is more convenient to use than a toilet ring. Add the fact that the toilet set is easy to clean and sturdy, and you’ve got a dependable toilet seat. Finally, the material is made from sturdy molded wood that is resistant to scratching and chipping. The Mayfair 148E2 Wood Toilet Seat incorporates many of the features you want to see in a quality toilet seat, namely durability, ease of installation and dependability. With the Whisper-Close hinge the seat and lid close slowly and quietly, so no more slamming to startle anyone or cause an accident. The toilet design also makes it easy to clean and change the hinge when it’s needed. With other toilet seats you had to call a plumber just to get the seat changed, but now you can do it DIY with no trouble. The ergonomic design is also matched by the reinforced molded wood. The wood finish also comes with a special finish so it doesn’t suffer from scratching or chipping. The 148E2 000 wood toilet seat is easy to install as has been noted by customers. The reason for this is the nylon bolt’s nut has a wing which you can hold onto. The upper bolt can also be tightened with a screwdriver, so there’s no need to use pliers. Another cool thing about the 148E2 is you can take the seat out without using any tools. Just rotate the latches on the bolt head counterclockwise by 90 degrees. The Mayfair 48SLOWA 000 is one of the best toilet seats available today. With the Easy Clean & Change hinge it’s a breeze to replace and clean the seat.After you’re done, just tap the seat and it shuts down quietly and slowly: no loud noises or slamming. The seat also uses the STA-TITE Seat Fastening System so it doesn’t loosen when installed. One of the trademarks of these Mayfair toilet seats is their durability, and the Mayfair 48SLOWA 000 lives up to this. The seat is made of molded wood and has been coated so the finish doesn’t wear off. Not only is the seat easy to install but it is compatible with the major toilet bowl brands in Canada and the US. Durability and compatibility are two of its biggest selling points, but the simple installation is another trademark. You just need a screwdriver to tighten the bolt, and a plastic wing makes it a breeze to handle the plastic nut. Installing and replacing toilet seats can be a pain with most toilet seats so this is a good sign. Finally, the 48SLOWA is strong, and even a 200 lb. person sitting on it won’t cause the seat to slide. The Mayfair 83SLOWA NextStep has several features that set it apart from others.For starters it is built out of heavy duty molded wood: it is not only durable and can withstand chipping, but it also has a high quality finish. There is no need to worry about compatibility either because the NextStep is compatible with all round bowls made in Canada and the US. Like the other Mayfair toilet seats, the 83SLOWA Adult Toilet Seat uses the STA-TITE Seat Fastening System so once the toilet seat has been installed it remains in place. Of course when the time comes you have to clean or replace the toilet seat, you can easily remove it. Like the other Mayfair toilet seats I have reviewed here, the seat has the Whisper Close feature so it closes without making any loud noises. The other thing I want to point out the inclusion of a potty seat so kids can use it, and along with the Easy Clean and Change hinges it’s going to be easy to do cleanups. The potty seat meanwhile, is kept in place by a magnet so it can be removed if required. As the name makes pretty clear, the AquaSense raises the toilet seat higher than a standard toilet.Ergonomically designed, the seat makes it easy for you to get on the toilet and off it. Built from polyethylene, it is simple to clean up and very convenient to use. Durable yet lightweight, the AquaSense is compatible with different types of bowls. The seat has a weight capacity of 400 lbs. It is 15 inches wide, has a seat depth of 15 inches and weighs 1.5 lbs. There is a lip along the bottom which fits on a bowl so the seat won’t slide when you’re on it. Because of the way it’s been designed there is no question it is compatible with round toilets. The AquaSense Portable Raised Toilet Seat is ideal if you have limited mobility. Because the seat is lightweight you can take it with you when traveling and use it anywhere you are. If you have mobility problems but need to travel, you can use this seat. If you have a hip injury, you can also use this at home and help with your functions. Unlike other toilet seats, the AquaSense is easy to clean up so it won’t be a bother. The KOHLER K-4774-96 Brevia Toilet Seat is built out of compression molded wood, giving it the feel and look of the seat that you won’t get with cheaper materials. The hinges are polypropylene and provide a solid attachment, ensuring it doesn’t come off. Design wise the Kohler looks good and should match both one and two-piece toilet bowls. Aside from the beautiful finish the seat is ergonomically designed so you feel comfortable on it. The toilet seat includes the required bolts and screws so installation is easy. From the hinge the toilet seat is 16.8 inches long and it is 14.2 inches wide. The toilet seat is also durable so unless you’re a heavyweight it should hold up just fine. The seat looks and feels heavy, a far cry from the usual cheap plastic you get from poorly made toilet seats. If you’re looking for a quality toilet seat the Stonewood is a good bet as it is built for the long term. Since installation is so easy – open the caps, set the thing down and screw it in – you’ll be using this in no time. Toto makes a lot of toilet seats and the SS114 01 SoftClose ranks among the best toilet seat they have to offer. The chief highlight here is the SoftClose action as it allows you to close the toilet seat quietly and slowly. Toilet seat slamming can cause accidents and if it happens on a regular basis, damage the seat. Sporting molded bumpers, the seat has an ergonomic design so you’ll be at ease. The SS114 01 SoftClose is made of high gloss polypropylene so it’s going to last for years. It is half an inch thick, 14 inches wide and 18 ½ inches long. Style wise they’re as good as any of the other Toto toilet seats and the SS114 01 seat / lid lives up to the tradition. The material feels solid and the screws fit in nicely. If you’re used to old toilet seats, the slow closing of the lid and seat might take some getting used to, but it’s something you’ll get the hang of eventually. The seat also has an inward dent rather than outward, but it’s not a big deal. Taking everything into consideration including the quality, ease of installation and durability, this is a good option. The Bemis 1500EC000 is a sturdy toilet seat, and as many customers have noted it is very durable.Manufactured in the US, the seat is designed for heavy duty use and very easy to install. A common problem with most toilet seats is the difficulty in installing them, but the Bemis 1500EC000 is an exception to the rule. If you need to remove the seat for cleaning or replacement, just twist the hinges and it’s off. Because the seat is quick to remove you can clean what would normally be hard to reach areas. I also want to say the material used for the seat is top notch: the molded wood is durable, and the glossy finish makes it resistant to chipping. The Bemis 1500EC000 seat has a slight inward slope, but it doesn’t do anything to affect the comfort level. The seat is very comfortable and it is secure. It doesn’t slide around and installation is straightforward. The material is solid and once in place you can be assured it won’t come off. Speaking of the installation, it should be pointed out that you can take the seat off without removing the screws, which is more convenient compared to other toilet seats. Buying a toilet seat is easy, but which one should you get? You’re going to use the toilet daily so it should be as comfortable and durable as possible. The following guidelines should help you find the right toilet seat to satisfy your needs. The toilet’s seat durability is crucial if you don’t want to keep buying replacements. Some seats have a maximum weight capacity, and that will really help. Aside from that you have to consider the materials. Most are made of plastic or wood, though more expensive toilet seats may use other materials. Plastic is durable, easy to clean and cheaper. Different types of plastic are used with some more durable than others. Wood toilet seats can be more expensive than plastic, but they are solid and should last a long time. However you need to make sure the material is of good quality so it doesn’t warp or splinter when used. The bottom line is there are a lot of toilet seat materials that you can pick from. a well-made toilet seat should be easy to install. The seat should include all the nuts and bolts needed for installation. In some cases you don’t even need to use a tool to remove or replace the seat. there are a lot of toilet seats available so you don’t have to spend a lot of money. quality toilet seats have durable hinges that won’t snap even when used regularly. Avoid toilet seats that use poorly made plastic hinges as they are prone to snapping. Look for hinges that slowly and quietly closes the seat so the lid doesn’t slam shut. However it shouldn’t be difficult to find a slow closing toilet seat as that has become the norm with the newer releases. some toilet seats are heated, and this can be a nice feature if you live in a cold place. For a heated toilet seat to work there has to be an electrical outlet nearby where you can plug it. make sure the toilet seat you buy is compatible with your toilet bowl’s shape and size. Here it’s a good idea to go with popular brands as they’re compatible with most round and elongated toilet bowls in the US and Canada. decide if you prefer an integrated nut and bolts mount or the traditional type. Integral nuts and bolts are more aesthetically pleasing but can be hard to remove as you have to drill the nut out. Between the two, it is more practical to go with typical nuts and bolts as they are easier to work with. some toilet seats have padding for warmth and comfort. This is a matter of very personal preference so it is up to you. The shape of the toilet you buy will depend on the shape of your toilet bowl. If the bowl is elongated you have to buy an elongated seat, and if the bowl is round the seat needs to be round as well. Now if you plan to change the toilet altogether you have to decide which of the two shapes is more practical to use. Round toilet bowls and seats have been around for a long time and is the one that is installed in most homes. These bowls are 25 to 28 inches long, so it won’t take up a lot of space in your bathroom. Round toilets are more common so it’s easier to find seats for it, and they are also more commonly installed in older homes than elongated ones. Round toilet seats are usually cheaper because they’re more common and easier to make. Potty training a child is easier to do on a round toilet seat than an elongated one. For this reason some people still prefer the round types. Large persons may find it difficult to sit on round toilet seats because it may be too small. Older round toilet bowls don’t have as powerful a flush as the elongated ones, and they are becoming less common especially in commercial establishments. Elongated toilet bowls are relatively new so toilet seats for them are not as common, but you can find them online. The elongated shape makes them more suited for larger and taller adults, as there is more space to sit on. Elongated toilets have a more powerful flush owing to the greater water surface. This also means you don’t have to do repeated flushing to remove waste. It is possible to set a toilet seat over it to train children. This will mitigate whatever disadvantage it may have in this department. Elongated toilet bowls cost more than a round toilet, and the same is true for the seats, but they are built for long term use. They will consume more space in your bathroom. If you have a round toilet, measure the bathroom space first and make sure there is enough space for an elongated type if you want to switch. The bottom line is when it comes to toilet seats you have to go with what you are comfortable with. If you are happy with the kind of toilet you now have, there is no reason to change it. Today’s toilet seats come in different styles and sizes, and there’s a shape that will conform to your toilet bowl. 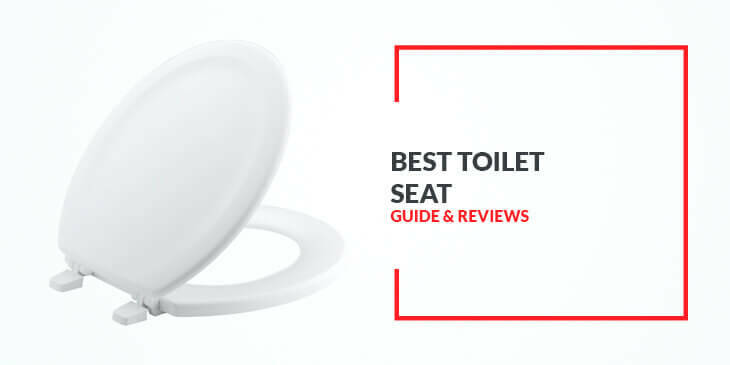 Finding the best toilet seat can be difficult if you don’t know where to start, and that’s why I have compiled all the information here so you can set the proper criteria for what to buy.